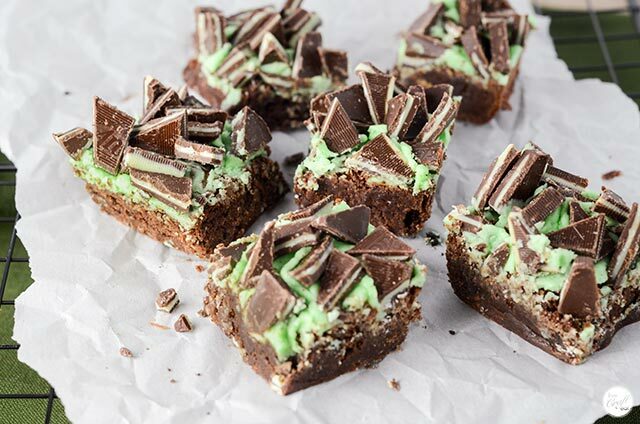 i’ve said it before, and i’ll say it again that mint + chocolate are two of my most favorite things in the world! i even grow mint in my garden because i like to add it to my limeade + everyone (neighbors’ kids included!) likes to just munch on them so they can have a nice minty flavor in their mouth! and chocolate…well, it’s a staple in my house, in any way, shape, or form. 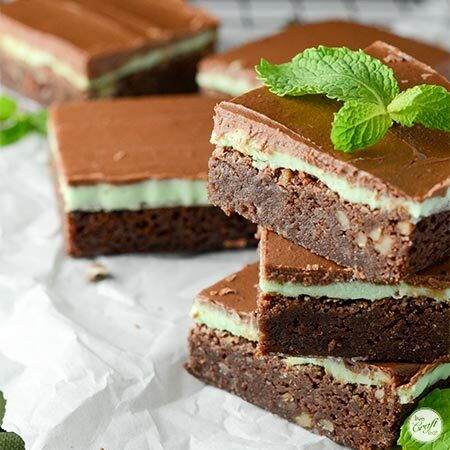 i usually binge on all things mint + chocolate during the christmas holidays, but these chocolate mint brownies are something that can be enjoyed year round – every day can be a special occasion when these are being served! case in point :: my mom always made these for holidays, parties, birthdays, and get-togethers, but she also made them “just because” – i think because she knew we all loved them so much, and she loved us! once i got married and moved out of the house i made them all the time too. i think if you try out this recipe you’ll discover why this is a family (and friend) favorite of ours! this recipe doesn’t start with a boxed brownie mix (not that i’m dissing boxed brownie mixes…i buy them all the time! they are the perfect base for homemade smores brownies, after all! ), but it’s a “from scratch” recipe. i know for some people those words are intimidating, but i am here to tell you that this brownie recipe is super easy and turns out great every time! it’s just a matter of mixing all the ingredients together in a bowl or stand mixer, and then pouring it into the baking dish! the ingredients used are really basic :: butter, sugar, eggs, vanilla, cocoa powder, and flour. and if you want you can add walnuts, too. i like them with walnuts, but the rest of my family doesn’t so i make these brownies without nuts more often than not. they turn out perfectly each time, either way! just place all the ingredients into one bowl and mix them together! no need for getting out separate bowls for wet or dry ingredients or anything like that. i don’t have time to wash that many dishes! one you’ve mixed all the ingredients you’ll have this deliciously thick and chocolatey batter. 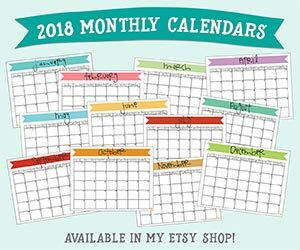 pour and spread it into an 8″x8″ baking pan (aff link). i like lining the pan with parchment paper (aff link), or even aluminum foil (aff link) if i’m out of the parchment, just because it’s easier to lift the brownies out of the pan and onto a cutting board where i can cut them into squares easier. 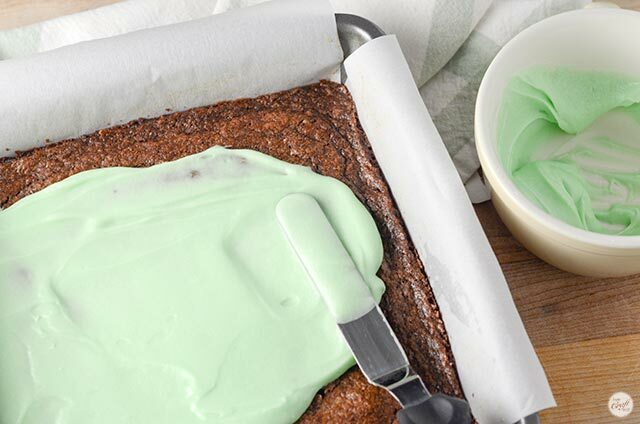 once the brownies have baked and cooled, it’s time to add the mint icing layer. it’s my faaaaav. i could just eat this stuff with a spoon. it’s so good. powdered sugar, butter, milk, peppermint extract, and a few drops of green food coloring are all you need. you can make the icing even greener than i have, but i like this paler “mint” green color. when you’re done spreading the mint icing layer over top of the chocolate brownies you need to let it set in the fridge for 10 minutes or so so it sets. this makes it easier to spread the chocolate icing layer, which comes next…. for this really decadent chocolate icing layer you’ll need powdered sugar, butter, cocoa powder, and milk. it’s really simple, but it goes so well with these brownies and is so soft and delicious! 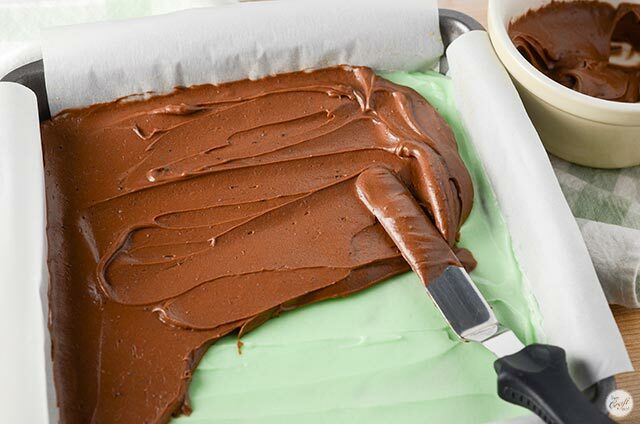 once you’ve spread this chocolate icing layer, you’ll want to get it back into the fridge again for another 10 minutes or so until the icing has had a chance to set. …or if you’re an oreo fan, the oreos with the minty cream center (aff link) and also a great option for chopping up and adding on top! oh my goodness, i’m in chocolate + mint heaven here!!! or…you can make a few batches and make all three variations! i won’t tell you exactly how many i ate and how many i shared, but it’s somewhere around the ratio of 2:1.
i’m thinking i’m going to have to make these again soon. i think tuesday would be the perfect day. is it a holiday/birthday/special occasion? nope. 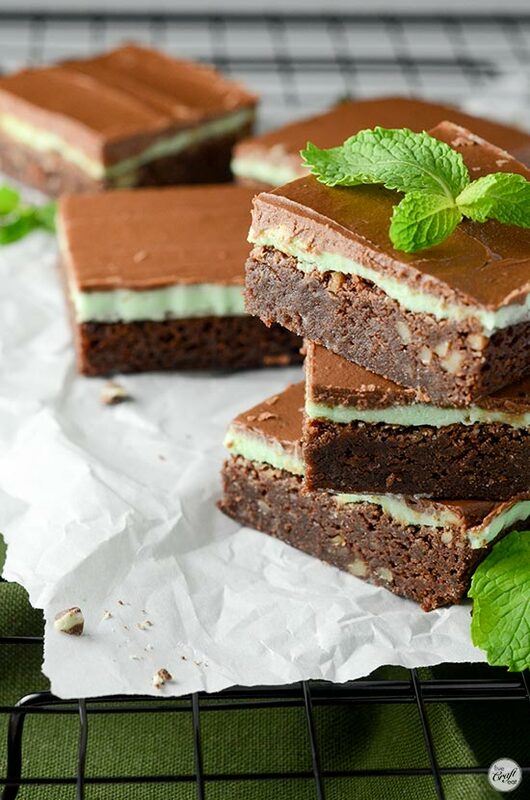 but when i make these mint brownies it will feel like one! 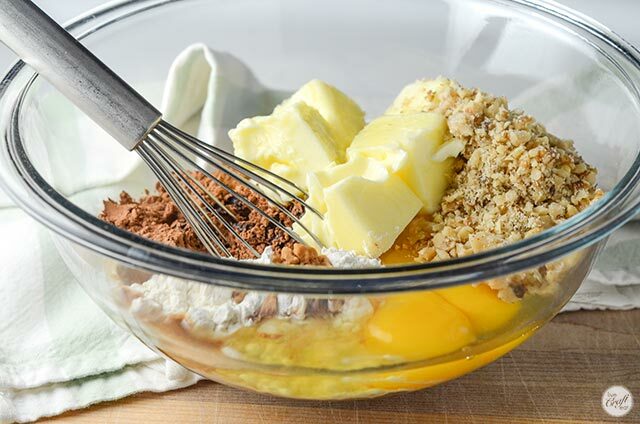 place all the brownie ingredients in a large bowl and mix well. spread into a greased 8"x8" pan. bake at 350F for 25-30 minutes. once cool to the touch, place in the fridge to cool completely. 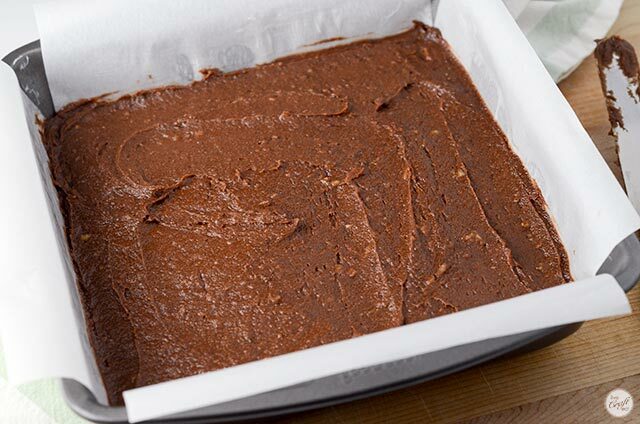 beat together all the ingredients and spread over cooled brownies. chill in the fridge for approximately 10 minutes, until icing has cooled and set. 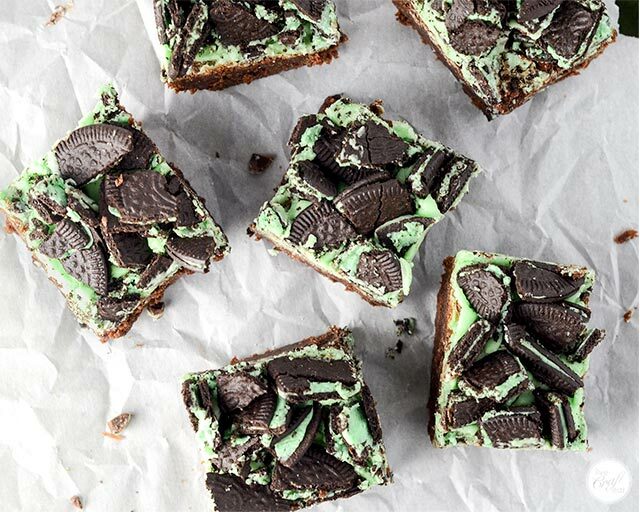 beat together all the ingredients and spead over the mint frosting. let chill in the fridge before cutting into squares. 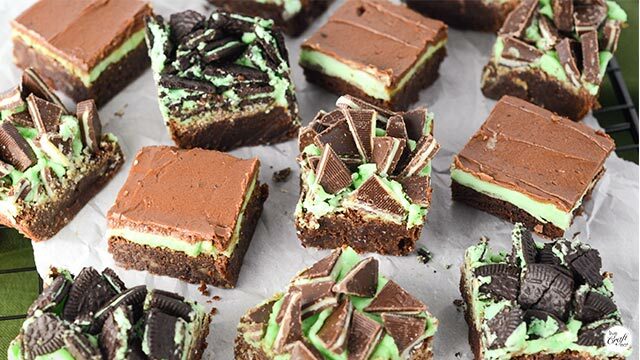 optional :: to make them even mintier and chocolatier, top with chopped andes mints or chopped mint oreos. yum!